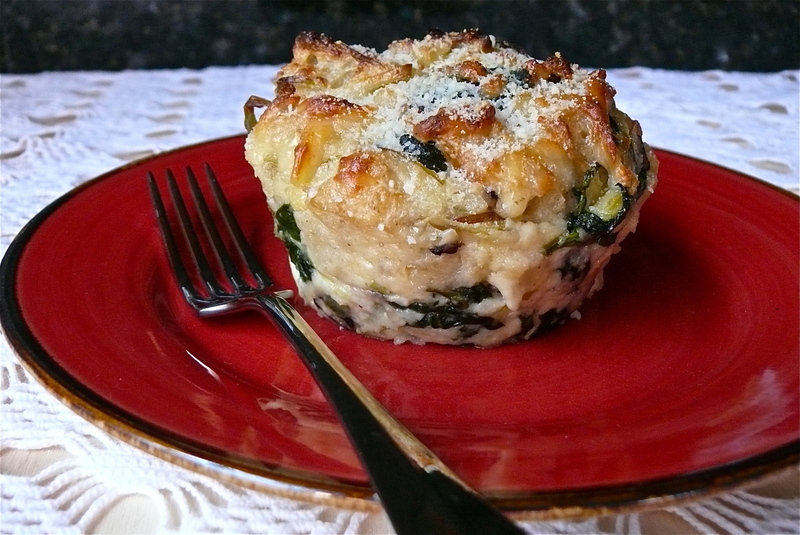 Spinach-Shiitake Bread Pudding | What about this? 1. In a medium skillet, melt 2 tablespoons of the butter. Add the shallots and leek and cook over moderate heat, stirring, until softened, about 4 minutes. Add the mushrooms, season with salt and pepper and cook over moderately high heat until lightly browned, about 7 minutes; transfer to a large bowl. 2. Melt the remaining 1 tablespoon of butter in the skillet. Add the spinach and cook, tossing, until wilted, about 1 minute. 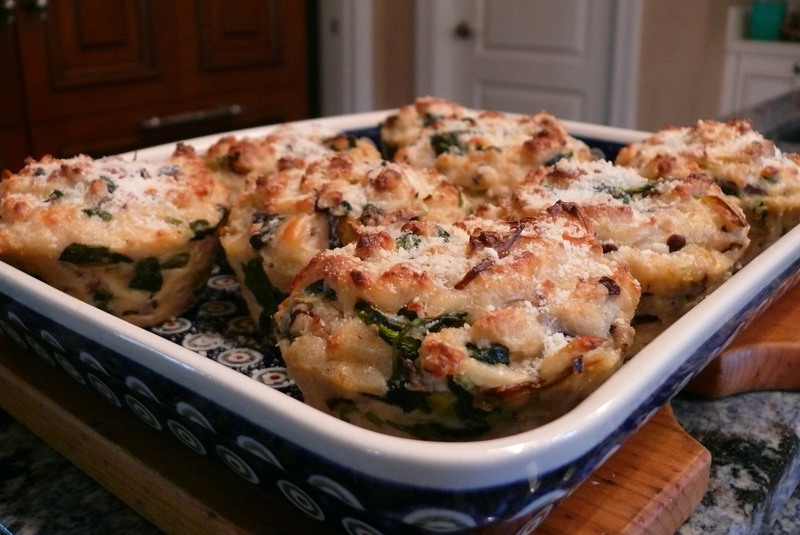 Add the spinach to the mushrooms with the bread, Swiss cheese and 1/2 cup of the Parmesan and toss. 3. Beat the eggs in a small bowl. In a saucepan, bring the milk and cream to a boil, then gradually whisk into the eggs. Stir the custard into the bread and let stand, stirring occasionally, until absorbed, about 15 minutes. 4. Preheat the oven to 400 degrees F. and butter eight 3/4-cup ramekins and set them on a baking sheet. Spoon the pudding into the ramekins and bake for 20 minutes, or until browned. Let cool for 15 minutes. 5. Preheat the broiler. Turn the bread puddings out onto an ovenproof platter. Sprinkle with the remaining 1/2 cup of Parmesan and broil for about 30 seconds, or until golden brown. Serve hot. 1. Note that both the Parmesan cheese and butter have divided use. 2. It’s always easier to cut bread with a serrated knife. I cut the bread into 1-inch slices first and then removed the crust from each slice. Don’t throw away the bread crusts – throw them in the food processor and make bread crumbs! 3. Be sure to whisk in a tiny amount of the hot milk-cream mixture into the eggs to temper the eggs. If you don’t add small amounts of the hot liquid at a time, you run the chance of cooking the eggs – too much heat all at once. As the eggs gradually adjust to the temperature, you can add larger amounts of the hot liquid. 4. Although this is meant to be a side dish, for those who want to make it heartier and serve it as a brunch item, a little diced ham could be added. Wow. That’s the kind of thing that makes me miss dairy. those look amazing! can’t wait to try them out! I’ll deliver one to you! I don’t have ramekins, do you think these could be baked in muffin tins?? Hi Jennifer – Thanks for visiting What About This? 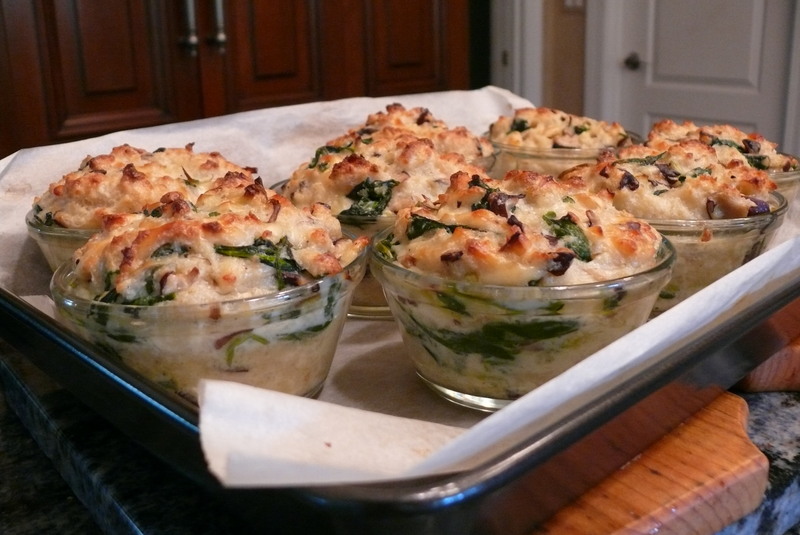 I don’t see why you couldn’t use muffin tins instead of individual ramekins. Just butter the insides of the tins and remember to adjust the baking time accordingly, as your portions will be smaller than the ones I made. Enjoy!